In case you missed the big news, Prince William and Kate Middleton just welcomed the second royal baby into the world and as it's a girl, Twitter think they know the perfect name for a princess. 1. 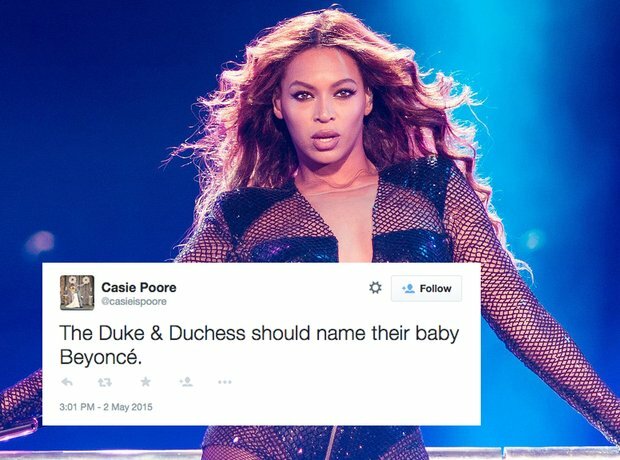 The Duke and Duchess of Cambridge just had a baby girl and Twitter has some baby name ideas. 2. Because the Beyhive are so kind, they are literally tweeting Kensington Palace with the suggestion. 3. It's not just young fans that think the Princess should be called Beyoncé. 4. Can someone start an online petition about this or something? 5. Very good point. Come on Kate, prove everyone wrong! 7. If anyone else in the world can pull it off, it's a princess, right? 8. You just know that when Kate goes to announce the name Kanye will appear and this will happen. 9. If Kanye says it, you have to do it. 12. Kate and Wills, give the people what they want! 13. Name the royal baby Beyoncé! 14. But some people are only interested in the other royal family, The Carters!